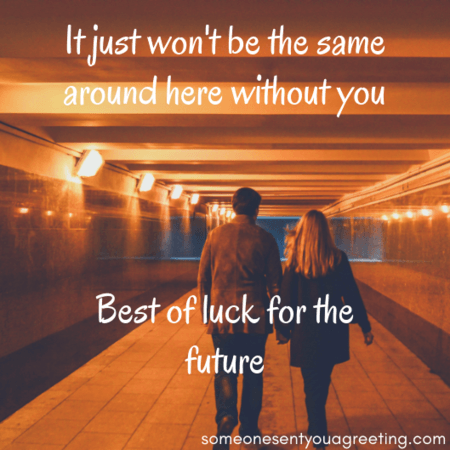 Is someone leaving your workplace and you want some farewell wishes for a colleague to write in a card? Need help finding the right words for a goodbye messages to coworkers? A colleague leaving your workplace is a sad time. We forge strong connections with our coworkers so having to say farewell can be tough. Especially if you were close to them. That’s why when they’re departing you should let them know just how much they meant to you. 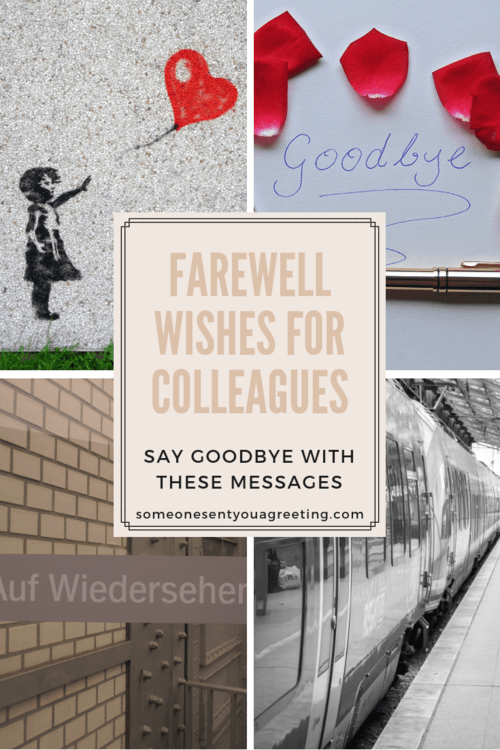 So in order to help find the right words we’ve put together some of the best farewell wishes for a colleague to help you out. Writing farewell messages are harder than they might first seem. Saying goodbye is tough. It can be hard to express how you feel to a colleague. They become friends, but because of knowing them through work it can make those relationships that bit different to other people in our lives. So when they leave work you can feel conflicted. They might be moving on to a new job or promotion, maybe even retiring, so your feelings might be mixed. Pleased for them but also sad to see them go. And so if you’re giving them a farewell card or gift then deciding on what to say in your message can be tricky. So use the farewell colleague messages and quotes below to help inspire you to let a coworker know how much you’ll miss them! 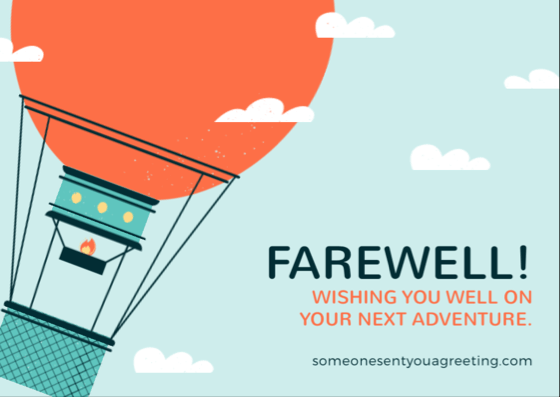 These sample farewell wishes are perfect for saying how much you’re going to miss a colleague that is leaving. Use them in a farewell card, with a gift or even to share on social media. 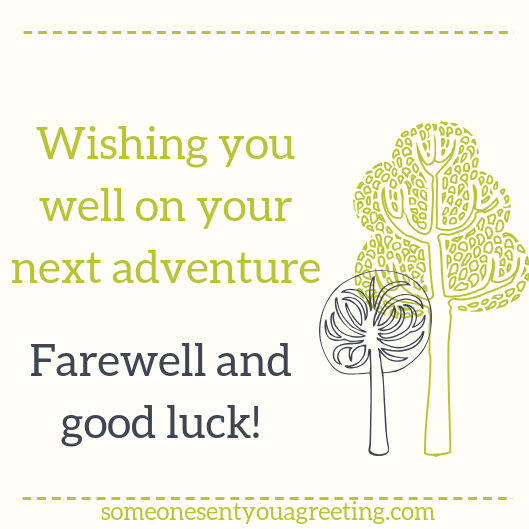 Wishing you well on your next adventure. Farewell and good luck! We’re all going to miss you so much. Farewell! I’m sure you’re going to do great with whatever comes next. Farewell and good luck! Congratulations on the promotion! Going to miss you but I’m really pleased and proud of all you’ve achieved. Farewell to my partner in crime. The office pranks are going to suffer without you to help me! You may be moving on to bigger and better things but promise not to forget us! Farewell! Wishing you all the best and may success follow you wherever you go! Farewell to an amazing colleague. Don’t worry, we’re going to throw you an amazing going away party! You were an asset for the entire department. We will surely miss you. Wishing you a great future! The whole workplace is going to miss you. Farewell and all the best! Sometimes a heartfelt goodbye is the best way to wish a colleague farewell. These messages do just that – saying goodbye when you know you’re going to find it tough. I don’t know what I’m going to do without you, but I sure you’ll do great on all your future endeavours. Goodbye and good luck! So long, farewell, auf weidersehen, goodbye – it’s gong to feel lonely with you gone. Just a quick note to say adieu! We’ll all miss you so much. So long! Beers are on you tonight! Big hugs and goodbyes to my favourite colleague. Keep in touch! 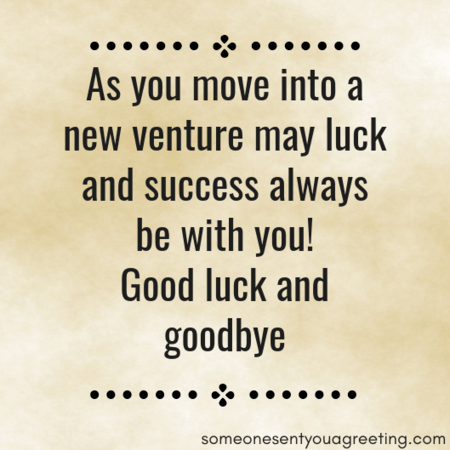 If you’re colleague is the right type then a funny message poking fun at their leaving could be the ideal choice. Enjoy a final laugh with your coworker and make a joke about their leaving. All the best for the future. Can I have your chair? I hope that your next boss will hate you so much so that he’ll kick you back here. Just kidding! Be good there and all the best for your new workplace. How much more money are they giving you? Write that number down. Double it. Throw the paper away. I don’t have that kind of money, but I can bribe you with brownies, my delightful smile, jokes, and my friendship. Reconsider staying! You’re leaving? Pfft, I never liked you anyway! You might be leaving but you can’t get away from me that easily! I’ll never forget you [insert wrong name]. Please don’t leave me alone with these people!! So long, I’ll miss our awkward conversations about the weather. I can’t wait to steal your desk. I mean, sorry you’re leaving… good luck for the future. Good luck finding better co-workers than us in your new job! I’ve worked with many people and I can honestly say you were one of them. I would like to taste the cakes before writing anything nice or contributing to your fund, please. Often colleagues have helped us or become a really important part of our lives. These farewell messages go beyond saying goodbye but also thank the colleague leaving for everything they’ve done for you. In the journey of life you meet several people who are hard to forget. I am glad to have met a person like you. I hope the path ahead is smooth for you and may you reach your goal without fuss. Thank you for being a part of my life. I’ve learned a lot working with you these past years. I know you’ll be successful in your new position. Thank you and goodbye! Having you as a partner at work was one of the best professional experiences in my career. Thank you for your guidance. Best of luck. The boss may be sad because of losing a hardworking and efficient employee, but we are sad because your heart-warming smile we will no longer see. Thank you and farewell. Maybe it’s you who have decided to leave or got a promotion, and you want to wish your colleagues goodbye. If so then knowing what to say to those coworkers might be causing you problems. Try some of these examples messages. I want to thank every single one of you for your encouragement and support. I couldn’t have asked for better coworkers and loved every minute of working here. I’m so grateful for the time I’ve spent working here but retirement beckons! It’s time for rest and relaxation.